Crunchy on the outside with a creamy filling, moms and kids alike will love this special breakfast treat. Spread almonds on baking sheet and bake for 3-4 minutes or until golden brown and fragrant. Cool. In a large bowl, whisk together eggs, milk, vanilla, powdered sugar, cinnamon and salt until well blended. In a medium bowl, combine 1/2 cup toasted almonds with crushed corn flakes. Set aside. In a small bowl, combine softened cream cheese and remaining 1/2 cup toasted almonds. Spread 6 slices of bread with 3 tablespoons of cream cheese mixture each. Top evenly with 1 1/2 cups sliced strawberries. Cover with remaining bread slices to make sandwiches. Coat same baking sheet with cooking spray. Dip sandwiches in egg mixture to coat evenly, immediately followed by the cereal mixture. Place sandwiches on prepared baking sheet. Bake French toast sandwiches for 10 minutes on one side. Remove from oven, flip with a spatula and continue baking for 5 more minutes or until golden brown and heated through. 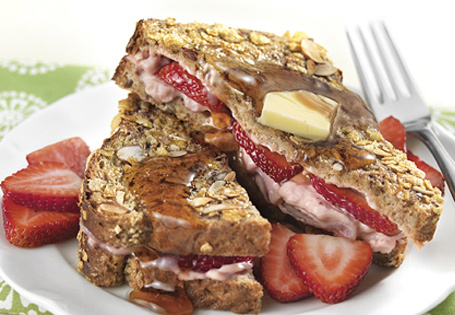 To serve, slice each sandwich in half diagonally and top with butter, maple syrup and remaining sliced strawberries. Tip: Have the kids participate by crushing the corn flakes, whisking the egg mixture and assembling the French toast sandwiches. Then have them decorate mom's plate with strawberries.